Possibly the most controversial design decision of the Tesla Model 3, even beyond its Renault Caravelle-like grille-less face, is its instrument panel, which consists solely of a center-mounted landscape-oriented LCD screen. 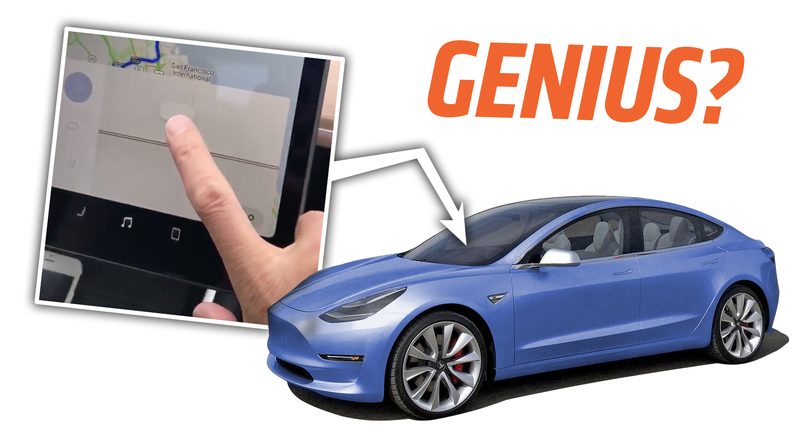 This tweeted video showing how the climate-control air-direction system works is one of the first real looks we’ve had at the Model 3's UI, and I really can’t say I’m impressed. Okay, so let’s just be clear about what’s happening here. The series of actions taken by (presumably) Lee’s finger there are to direct the flow of air from the A/C to the vents hidden in that dark horizontal band across the Model 3's dashboard. These controls are invoked by pressing the small fan icon at the bottom of the display, which then opens a window in the lower right corner of the screen. That window is divided into two panes, the left one having the basic climate controls—fan speed, temperature, face/feet airflow, etc—and the right pane containing the interface to adjust where the air flows. That’s the focus of this little video, so let’s focus on that as well. The interface consists of a horizontal bar, which I guess is supposed to represent the dash’s vent bar, and an oblong ‘thumb’ that can be positioned anywhere on the panel, and can also be split in two via a little button at the lower right. So, if I’m understanding this properly, the position of the oblong represents where the airflow is directed? And you can split it into two points? I think there’s a hell of a lot wrong with this UI. I have a background in UI/UX design, if that helps add any value to what I’m going to say, but I’m pretty sure what I’ll be pointing out are things anyone would notice. First, that thumb is needlessly low-contrast; why do a light gray control on a slightly less light gray background like that? Is there a reason not to make it more visible, maybe use the blue color that’s also in this UI design? The whole idea of the oblong is weird. I don’t normally think of airflow as hitting a given point in space; airflow is more of a directional vector—it flows out from a source, in some direction. Picking a ‘point’ like that for where the air goes is not very natural feeling. Then, there’s the question of how is this to operate while you drive? The nature of a touch screen, drag-to-position interface is that it is entirely visual. There’s no tactile feedback, and you need your eyes to focus on the control to drag it about with your finger. With conventional physical vent controls, you never needed to take your eyes off the road; that interface was entirely tactile. You could actually feel the flow of air, and you used your hand to direct vanes to redirect the air. Feedback was instantaneous and immediately understandable. Plus, these touchscreen HVAC controls are modal, in the sense that they don’t always exist, and require the driver or passenger to enter a separate window to display the controls. While up, they obscure other controls and displays (it looks like the audio system, in this case). This means that if the driver wants to redirect the airflow while the passenger changes the song, someone’s going to have to wait until the other is done. That’s not ideal. The whole ventless HVAC thing all seems like a design solution that invents a problem that never really existed. Sure, it does look cleaner, but I never minded the look of most physical dashboard vents. Some even enhanced the interior design. Physical vents also gave visual information about the airflow even when the car or A/C or heat wasn’t on. You could see which vents were closed, which ones pointed one way or the other. They inherently retained the last-used position, and allowed for airflow in more than two directions. The more I think about it, the more I come to the conclusion that the Model 3's HVAC solution isn’t “genius” at all; it’s stupid. Perhaps there’s some manufacturing cost savings with the one long mono-vent; making the controls in software could be cheaper, but it also necessitates some sort of electric actuator to direct the airflow. Which is another thing, buried deeply and expensively inside that dashboard, that can break. I want to be clear that there are things I like about Tesla’s approach here, and I’m not some traditionalist stuck in the past. I very much appreciate that they’re not falling into the usual trap of faking analog gauges, and I think an LCD screen can be designed to be a very effective instrument panel. Physical vent controls and vanes aren’t ‘clumsy’ as Bill Lee suggests. They’re really quite elegant. They take no extra power, they give direct and immediate feedback, they don’t require taking eyes or attention off driving, they allow for greater flexibility of airflow directions, and they’re non-modal, and don’t lock out any other controls of the car. The Tesla Model 3's solution is less effective in every possible way. That’s a weird idea of “genius,” if you ask me. Also, Why Is Everything So Damn Small On That Screen?